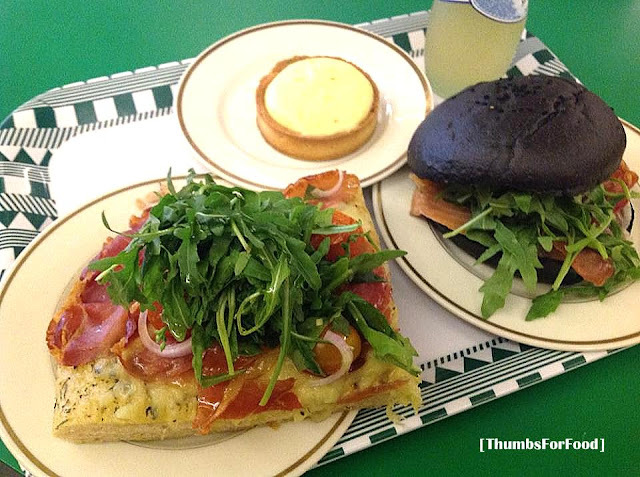 Just like I have promised, I would be doing a post on Tiong Bahru Bakery in Raffles Place! Do visit the post on the outlet at Tiong Bahru here to see what other pastries I've tried. The outlet in Raffles Place is much larger with more seating capacity. It is located at the basement with an "open air" concept. And I tricked my friend that we were changing venues and going Tiong Bahru. She really fell for it! Like the one in Tiong Bahru, it's all self-service from ordering to paying to taking your own water and cutlery. Compared to Tiong Bahru, the one at Raffles Place closes at 10pm and I feel that they offer more variety. Their glass displays of their pastries really make one drool. It is hard to ignore the temptation when you pass by the displays. Desserts! So many to choose from! I came here on two occasions. The first occasion I was too hungry to take individual shots of the food. We ordered Focaccia ($8), Squid Ink Bun ($8.50) and Lemon Curd Tart (about $6). Yup, we were so hungry we gobbled up the buns. Both the Focaccia and Squid Ink Bun comes with a generous portion of Rocket Greens that overflows the buns. My dear friend did not like the taste of the Rocket Salad. The Focaccia I felt, was nothing too special. I don't think I will eat it again though. The Squid Ink Bun, for me was quite unique. My first time eating this flavor! It was served with smoked salmon and I pretty like the combination! Though, I feel that it is a little on the pricey side. The lemon curd tart like the Mandarine and Orange Promegranate Tart's crust was hard! It was so difficult to eat the tart elegantly. I guess the cleanest way to finish it would be to grab it it your hand and take bites straight from the tart. I like the Lemon flavor though! On the second occasion, we visited Tiong Bahru Bakery with a half-filled stomach! We were craving for some bread and ta-da, the Croissants lit up in our minds! So we ordered original Croissants ($2.50), Chocolate Croissant ($3.50) and Pandan Flan ($4). This time, we withheld our enthusiasm and took individual shots of the food! I have never eaten a flan before. And I got to say I do like their Pandan Flan! It's texture is like a kind of kueh kueh, which I can't remember the name. And it's appearance really looked like a cheese cake. I like that it was smooth. The pandan case on the other hand was subtle. My friends felt it was like an egg tart/egg pie?! If you're curious of the taste, no harm trying! Croissant is a must-have! No need to say more! Chocolate croissant, I felt, paled in comparison. I still like the original flavored croissant. It's a personal preference ya. Birds of the same feather flock together; my friends enjoyed the original one more as well! Yea, so if you're in City Hall Area, and craving for some pastries and buns, you can just make your way to the basement. It's quite good chillout place! And yes, do look out for the legs of some of the tables. They are uniquely designed! Anyway don't forget to like us on facebook and follow us on Twitter and Instagram. The links are on the left sidebar. Do support our passion for food!